American food culture has changed significantly over the past decade. Today's college students are drifting away from greasy pizza and hamburgers and toward organic produce, whole grains, and foods from around the world. Some students require vegan or vegetarian food options while others prefer food with a low carbon footprint. Many students focus on eating food that is ethically sourced, nutritious, and environmentally conscious. To address this new generation of students, many colleges have revamped their dining programs. 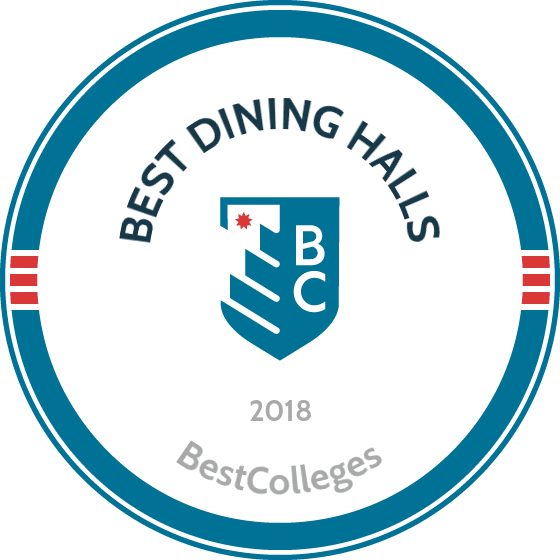 Below, we have ranked the best dining halls around the country. This list reflects many of the significant changes made to the campus food service industry. Students can now access specialized food choices, like made-to-order sushi stations, gelato bars, and Latin-inspired food trucks. Many of the best dining programs serve food from campus gardens or local vendors and provide only reusable or compostable utensils, napkins, and to-go containers. To celebrate progress in college dining, our ranking emphasizes innovation in food sourcing, waste reduction, and other sustainable practices. We consulted food industry sources to evaluate award-winning programs, and many of the schools listed received a Loyal E. Horton Dining Award within the past five years. The best schools also create a fun environment for students by hosting events, festivals, and theme nights. Hendrix College is a small, private liberal arts school located in Conway, Arkansas. Its dining program serves a diverse selection of tasty, nutritious food in a clean environment. The main dining hall features a grill and a World's Fare station that serves cuisine from around the world. Daily options include a deli, a salad bar, a wok, and a soup bar. In 2017, the school received three gold ratings from the Loyal E. Dining Awards for its residential dining, special events, and catering. The dining program at Hendrix also emphasizes sustainability. Recently, the school started a campus garden that supplies produce to the cafeteria. Other produce is sourced from local, organic vendors. In addition to serving vegetarian options on a daily basis, the cafeteria also practices Meatless Mondays. Hendrix works to create a fun dining environment for students. Lucky students will find themselves using the sparkly disco dining tray and, on their birthday, enjoy a personalized birthday cake and a cafeteria-wide serenade. Cal Dining at Berkeley is one of the greenest food service programs in the country. The school uses environmentally sustainable practices and strives to reduce waste to 0% by 2020 through a strict recycling and composting program. The university offers snacks in zero-packaging bulk bins and promotes the use of reusable cups and containers across campus. The school also focuses on flavor, variety, health, and wellness. Cal Dining hopes to eventually eliminate the use of trans fats and promote more plant-based options. The school serves vegan, vegetarian, and non-dairy options at all locations, and there is even a plant-forward dining hall that also offers kosher options. To promote healthy hydration, all dining areas offer sugarless beverage options, such as infused and carbonated water. One of the school’s cafes is hyper-local and offers foods with ingredients exclusively sourced from within 250 miles of Berkeley’s campus. The dining program at UMass-Amherst is based on four core tenants: health, sustainability, world flavors, and community. The program aims to obtain its food locally and serve bigger flavor on smaller plates. Students at UMass-Amherst have access to four dining halls, 18 cafes, two food trucks, a bakeshop, and delivery services. Options also exist for those who require a kosher or halal diet. The school hosts a variety of dining events, including barbecues, sampling days, harvest dinners, and farmers markets. UMass-Amherst was the first school to offer SPE-certified meals, providing food with maximum nutrition and taste. The school is committed to sustainability, investing $4.5 million into sustainable and local foods in New England over the last year. The university strives to reduce waste through trayless dining, putting a ban on plastic bags, and using fewer non-reusable bottles and cans. In one dining hall, a trash monster built from non-recyclable materials reminds students to reduce their waste. Concentrating on fresh ingredients and diverse culinary options, Liberty features a variety of dining choices. The school’s main dining hall offers an innovative approach to dining, with 22 unique areas, and the school's food service program focuses on serving students, faculty, and staff healthy food choices. Liberty boasts one of the nation’s best gluten-free dining experiences; at its simple servings station, students have access to food that is free of seven of the most prominent food allergens. The dining hall also includes a bbq slow-cooker, a Mongolian grill, and regularly serves made-to-order sushi. Liberty offers international menus, unlimited pizza, coffee, smoothies, and a salad bar. The school can serve up to 6,000 students during a single meal. The school, located in Lynchburg, Virginia, also makes campus-wide efforts to increase sustainability. In addition to a trayless cafeteria, the school uses sustainably sourced plates, cups, and recycled napkins. Kennesaw State University emphasizes sustainability. The school runs its own campus garden, including a 1,200-square-foot herb garden, and features a strict recycling and closed-loop composting program. These efforts prevent more than 40,000 pounds of waste from entering landfills each month. To address food insecurity at the school and in the surrounding community, KSU donates ready-to-eat food to those who need it. The school plans to expand its food donation efforts in 2018. KSU’s main dining area boasts a variety of nutritious food options. The school's dining services also host a weekly farmers market in the spring and fall, providing students with access to locally sourced organic produce. To make dining more convenient, the school uses an app that lets students order their food remotely. Students at Emory have a variety of dining options across campus. In addition to dining halls, bakeries, and cafes, students can eat at several food trucks that operate late into the night. Many of these dining areas post menus online, providing students easy access to nutrition information and meal-planning. To help ensure that the school is addressing student needs and desires, Emory’s student-run Food Advisory Committee meets once a month, acting as a liaison between students and dining staff. Emory's dining program aims to grow 75% of its food locally. In addition to reducing waste through recycling, source reduction, the elimination of plastic bags and Styrofoam, and encouraging energy and water-saving efforts in kitchens and dining halls, Emory also donates excess unsold food to Campus Kitchen Emory, which is a student-run service that redistributes surplus food to local food pantries. Vanderbilt’s dining services have accrued nearly 25 awards over the last five years. The school offers 22 unique dining locations across campus, allowing students to access nutritious food whether they want to have a sit-down meal with friends or grab something between classes. Several of the school's dining locations cater to students 24 hours a day. At the main dining hall, students can select made-to-order stir fry and sandwiches; specialty pizzas; or pastries, cakes, and bagels. Special events, including biscuit bars and produce stands, offer additional variety. Dining services at Vanderbilt use a custom campus dining app and Twitter account. Additionally, the school's online nutrition calculator helps students build a healthy diet, no matter where they choose to eat. UCLA’s dining services feature four all-you-can-eat dining halls, four restaurants, and an online service that allows students to order pizza and wings to pick-up. To accommodate a variety of diets and food restrictions, the school has kosher and halal options, a gluten-free pantry, and an online list of wellness meals served at each dining area. Dining also plays a large role in UCLA's commitment to sustainability; 19% of UCLA's produce is purchased from sustainable sources, and the school buys cage-free eggs, fair-trade-certified coffee, and United States Department of Agriculture-certified organic fruits and vegetables. In addition to composting, recycling, and enacting a trayless dining program, the school also practices Beef-less Thursdays and Green Mondays. UCLA is an especially convenient place for vegans and vegetarians. It was named People for the Ethical Treatment of Animal's (PETA) most vegan-friendly campus in 2010 and features one of the country's first health-themed dining halls. Another dining hall is inspired by American street food cuisine and features a Flex Bar. UChicago’s dining services operate three dining halls and a variety of cafes and markets across campus. Throughout the year, each dining hall takes turns hosting a fourth meal for night owls that takes place from 9 p.m. to midnight. The dining service caters to a variety of diets, including kosher, Zabiha halal, vegan, vegetarian, and gluten-free, offering an online menu to help with meal planning and nutrition tracking. One of the university's cafes also offers a vegan Impossible Burger. The school's Treats from Home program allows student’s friends or family to send them personalized cakes, cupcakes, and giant cookies. UChicago Dining monitors its progress through a mystery diners program, where students, faculty, and guests leave anonymous feedback about their dining experience. The dining program monitors this feedback in an attempt to increase customer satisfaction. The dining services at UC-San Diego oversee 17 locations across campus. In addition to dining halls and restaurants, the school boasts two on-campus food trucks. Dining halls feature diverse food options, including poke bowls, gelato, and made-to-order sushi. In some locations, students can take their meals onto an outdoor patio or eat inside by a fireplace. The school also accommodates kosher and halal diets. To address health and wellness on campus, the school provides dietician services to help students with dietary concerns customize their menu. Vegans and students with food allergies can take advantage of several online and on-campus resources to find diet-friendly dining areas. The school also offers nutrition workshops and a health library. An active sustainability program is headed by a team of student EcoNauts and features hydration stations and green grants that give students the opportunity to earn money for their sustainability ideas and projects. The dining services at Stevens offer six dining locations across the school’s Hoboken campus. These options include a student dining hall, a faculty dining hall, and multiple cafes. One dining area offers a grill where students can build their own burger with meat or veggie patties. The dining program is committed to nutrition, offering balanced meals that address the dietary needs of vegans, vegetarians, and those with food allergies. Students can also consult with a full-time registered dietitian who specializes in sports nutrition and weight management. In 2016 and 2017, the program received a Loyal E. Horton Dining Award recognizing its residential dining concepts. In 2017, it also earned an award for its special San Gennaro on the Point program, which featured carnival games and Italian dishes like calamari salad and cannolis. Pitzer College, located about an hour outside of Los Angeles, is a small liberal arts school that offers high-quality food at several locations. The school’s main dining hall has diverse food options, including sorghum succotash, a pad thai bar, and a taco bar featuring achiote tofu and carne asada. The dining hall also offers regular theme nights like Mediterranean Mondays and Surf and Turf Thursdays. As part of its commitment to serving environmentally sustainable food, Pitzer’s website has a map featuring the locations of farms that provide the school with food. In addition to the main dining hall, students can also eat at several bistros and cafes across campus. In 2007, a group of students started a student-run restaurant that offers locally sourced meals and provides food education and a venue for art, music, and cultural events. For years, SUNY Geneseo has bought food locally. The school partners with area vendors like Chobani and Monk's Bread and works with distributors to maximize the amount of local food on campus. In 2015, Geneseo deepened this commitment by signing the Taste NY Pledge, vowing to buy and use more locally grown food and products in its campus restaurants and dining halls. The school has won multiple National Association of College & University Food Services (NACUFS) medals and ranked as the second best gluten-free college in 2014, thanks in large part to the gluten-free kitchen found in one of its all-you-can-eat restaurants. The school's sustainability programs feature trayless dining, a reusable mug program, vegetable oil recycling, and Styrofoam elimination. Geneseo also promotes Meatless Mondays and encourages nutritious dining. In the fall of 2018, the school plans to open a new dining complex that features a pay-one-price restaurant with vegetarian and gluten-free options. The dining program at Yale is built on a tradition of hospitality. The school has 23 on-campus dining facilities. This includes several specialized dining halls, such as one for kosher meals and one for graduate students and their families. Students with food allergies or dietary restrictions can work with managers at their dining hall, where staff can prepare a special menu or certain foods. To encourage community, each of Yale's 14 colleges has its own residential dining hall. Yale’s sustainable food program began in conjunction with chef Alice Waters when her daughter enrolled at the school in 2001. Since then, Yale has started an on-campus farm and increased its efforts to educate students about sustainable agriculture. Some professors also use the farm as a teaching aid. Other sustainability efforts include trayless dining, waste reduction, and water and energy management. Virginia Tech’s dining services serve more than 7.5 million meals each year to more than 19,000 meal-plan holders. It regularly receives awards and honors, including recent recognition for excellent vegan and healthy food options. With more than a dozen dining locations, which includes cafes, snack kiosks, food courts, and two on-campus food trucks, students have a wide variety of food options. As part of its sustainability initiative, Virginia Tech’s college of agriculture and life sciences' farm grows produce for on-campus dining with the goal of a farm-to-table timeline of less than 24 hours. Additionally, since starting a compost program in 2009, Virginia Tech has diverted more than four million pounds of food waste from landfills. To reduce wasted water bottles, the school offers refillable water bottles at a nominal cost. To further reduce waste, some dining facilities use reusable to-go containers. Washington University offers local and artisanal foods from 25 local vendors within a 150 mile radius of campus. The school features hormone-free meats in its dining rooms, fair-trade coffee, and reusable or recyclable dishes at all of its dining locations. Since 2009, the school's main kitchen has recycled more than 23,000 gallons of cooking oil into biodiesel, which fuels campus delivery trucks. These efforts helped WU win a 2014 gold medal at the NACUFS Sustainability Awards. The school also joined the Environmental Protection Agency's Food Recovery Challenge, an initiative that strives to find alternatives to throwing food away. In addition to sustainability, WU strives to improve student health. The school's dietician regularly collaborates with campus chefs to create flavorful and healthy menus. The school's Bear Balance Movement is a campus-wide initiative aimed at improving student health by eliminating fried foods, offering healthier dessert options, and increasing the availability of fruits and vegetables. Students can also take cooking classes and enjoy on-campus pop-up kitchens. The University of Georgia’s in-house dining services allow the school to completely customize its student dining experience. Since 1987, the school has put on a yearly Taste of Home competition that encourages students to submit a favorite family recipe; dining hall staff serve the winning recipes at a celebration, and some make it into the dining hall's menu. The school has three dining commons that offer a variety of foods for meat-eaters, vegans, vegetarians, and students with food allergies or other dietary restrictions. Students can also order customized burgers, sandwiches, omelettes, pancakes, burritos, and stir fry. Other highlights include a milkshake bar, pizza sold by the slice, and a taqueria. The school's sustainability initiative features trayless dining and a recycling and compost program. All disposable items in the dining halls can be composted, and the school's compost is converted on campus and reused. The school's Georgia Grown program labels which foods were grown in the state. The dining program at the University of San Diego is known for having a diverse selection of healthy options. In 2017, it received a grand prize and gold medal from the Loyal E. Horton Dining Awards for its retail concepts. The school offers a dining hall, cafe, restaurant, market, and coffeehouse. A campus food truck features Kumeyaay Indian, Portuguese, and Asian flavors. The school hosts special events such as Mardi Gras dinner, late-night breakfasts, and an apple and strawberry festival. The school also serves Thanksgiving and Christmas meals. USD earned an A+ rating from PETA for its vegan options, which it offers at dining halls and retail stores across campus. The school is also committed to sustainability, boasting a tray and Styrofoam-free campus, a reusable water bottle program, and the country's first on-campus BioHiTech digesters, which break down food waste. Located just 25 miles outside of Chicago, Wheaton College features a dining program committed to health, sustainability, and taste. The school's sustainability platform, Green Thread, emphasizes responsible sourcing, waste minimization, transportation management, and the conservation of energy and water. To create a healthier campus, the school started a Healthy for Life initiative in conjunction with the American Heart Association. This initiative resulted in more vegetables and calorie-conscious food options, increased nutrition education and wellness events, and labelling that helps students select healthier options. The school is also committed to addressing dietary needs in a sensitive manner. The dining hall features an Allergen Solutions station where students can select from foods that lack seven of the most common food allergens. Wheaton also accommodates vegans, vegetarians, and students with gluten intolerance and strives to serve a culturally diverse menu. With special meals for Ramadan, Thanksgiving, Christmas, and Chinese New Year, Roger Williams University offers a diverse variety of foods. Parents can order a Surprise Your Student care package, selecting from birthday surprise, snack attack, healthy snack, and pizza party options. The school has eight dining areas across campus, including dining halls, cafes, convenience stores, and express stores that have grab-and-go options for breakfast and lunch. RWU also emphasizes sustainability in its dining services. The school aims to source food locally and serve meals that nourish the community. Dining halls serve sustainable seafood, cage-free eggs, and crate-free pork. About 25% of the school’s vendors can be found within 150 miles of campus. In 2017, the school participated in the Rhode Island food summit to discuss ways to increase sustainability in the state. Those of us who have attended college have at some point eaten a meal in the college dining hall. Depending upon where one attended college, the thought of those meals may still be waking you up at night in a cold sweat. When people used to talk of college dining halls, the words that came to mind were less than flattering. Cold food, undercooked food, mystery meats that gave no clue as to their true identity were the norm for those from the dorm. College food was often thought of as disgusting, and many parents worried how their kids would do when they went off to college and had to start eating at the dining hall. Well, while there may still be some dining halls that are less than ideal, the college dining experience has definitely undergone a transformation for the better. Gone are the standard cafeteria-like settings, with lunch lines and trays full of non-descript and boring foods. What has replaced them is a smorgasbord of well-known restaurants full of everyone's favorite foods. The lunch lady in the kitchen stirring the mystery soup has been replaced at many colleges by an executive chef and well-trained kitchen staff, whose job each day is to create culinary masterpieces sure to delight any college student's stomach. The health implications of having a good college dining hall are numerous. Previously, most students who chose not to eat in the dining hall instead became regulars at local fast-food and pizza places, eating unhealthy meals two or three times per day. This not only leads to weight gain but also other health problems such as high cholesterol and high blood pressure. Most of us have heard of the so-called "freshman 15," where first-year students would put on an additional 15 pounds due to eating so much unhealthy food. Nowadays, the threat of a huge weight gain is much lower. Students in today's dining halls have many choices of good, low-fat and low-carb foods that will fill them up without filling them out. Students who have health issues such as diabetes or other conditions requiring special diets can have those taken care of in today's dining halls. Many more students today are into health and fitness, and are much more careful about what they put in their bodies. Colleges who are emphasizing healthy eating can also cater to these students, helping them stay in shape while completing their studies. Upgraded dining facilities also lead to fewer students getting sick because of what they ate, helping colleges gain a reputation for good food while decreasing the number of students in the infirmary. Having great food can have a real impact on one's college education. We are what we eat, and what goes into our bodies can have a real impact on how we feel during the day. Going to class on an empty stomach or with a stomach full of bad food leads to problems with concentration, mood swings, headaches and more. Being able to eat good foods morning, noon and night can help students feel better both physically and mentally. College dining halls are places for students to get together, and the more inviting they are the better students feel. Dining halls such as Virginia Tech's West End Market offer students everything from Italian restaurants to big-screen TV's in sports lounges. Students can enjoy good food while catching up with friends, turning dining halls into campus hangouts instead of places to avoid. When students are deciding which school to attend, the usual stuff comes into play such as academic programs, athletics and extracurricular activities. However, with the evolution of college dining facilities this has also become part of the decision-making process. Students considering a school need to consider the dining facilities as well, particularly if they have a medical condition that requires a special diet. Those students who are vegetarians or vegans also need to take a close look at a college's dining arrangements. Vegetarians and vegans are becoming more numerous on college campuses, resulting in more schools creating restaurants specifically for this student population. A great example of this is UCLA, which recently won an award as the Most Vegan-Friendly College from PETA. Students taking a look at the dining halls of colleges and universities should also consider the variety of foods offered. While healthy eating is still the goal, many students still like a thick slice of pizza or a big burger and fries now and then. And who can pass up a good chocolate-chip cookie or slice of homemade pie? Some college dining halls, including Virginia Tech and others, actually use recipes from parents of students for some dishes. Sushi, wings, gelato and more are being offered to students on today's college campuses. Some colleges, such as St. Olaf's in Minnesota, use meat, poultry and vegetables grown on the campus organic farm. Fruits are brought in from a campus orchard, and dairy products are from nearby farms. These top dining halls excel in each of four areas: diversity and accessibility of food, commitment to nutrition and wellness, commitment to sustainability and waste reduction, and dedication to student satisfaction and community outreach. Dining halls offer a nutritious, diverse, and high-quality selection of food while reducing food waste, buying or growing food locally, encouraging sustainability education on campus, and addressing food scarcity in local communities. The best dining halls also enhance the student dining experience by providing a clean, efficient, and pleasant space for students to eat. Many of these dining halls also host theme nights and special events, cultivating a positive culture around campus dining.